A double-wall steel case and unique ‘secondary combustion’ features create a new kind of campfire experience. Backyard fire pits are pretty great. But with fire comes smoke, which in urban areas can cause trouble with neighbors, not to mention irritate your eyes. 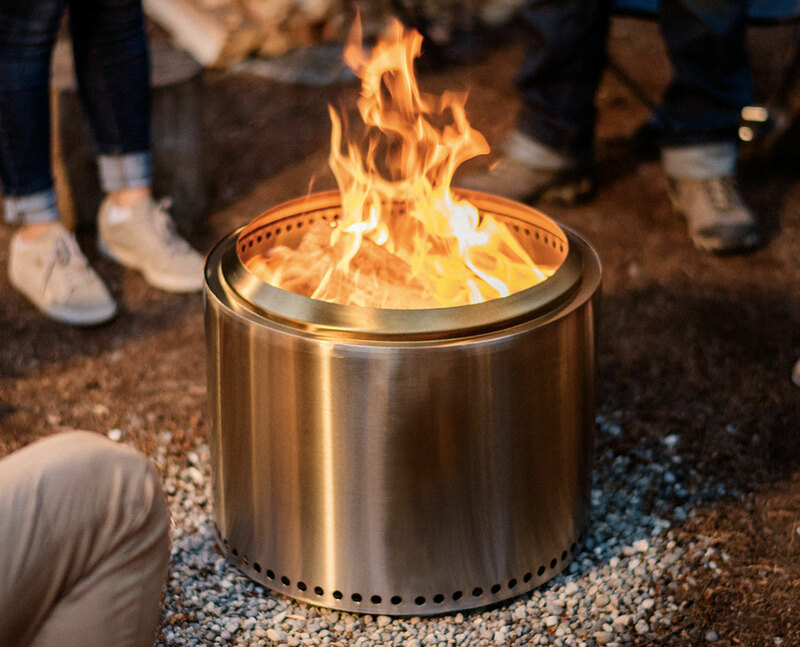 The Solo Stove Bonfire ($350 retail; on sale for $300) works thanks to well-engineered airflow. Basically, cool air flows into the stove and is channeled into one of two directions. Some air flows up and into the flames and fuel. Other air is warmed between the double-wall steel before flowing into the top of the flames. There, it causes “secondary combustion,” basically burning off remaining fuel suspended in the air. In essence, this burns the smoke, leaving few particulates in the air. The result is impressive. In a test outside the GearJunkie office, we noticed nearly clear air above the roaring blaze of the Solo Stove. 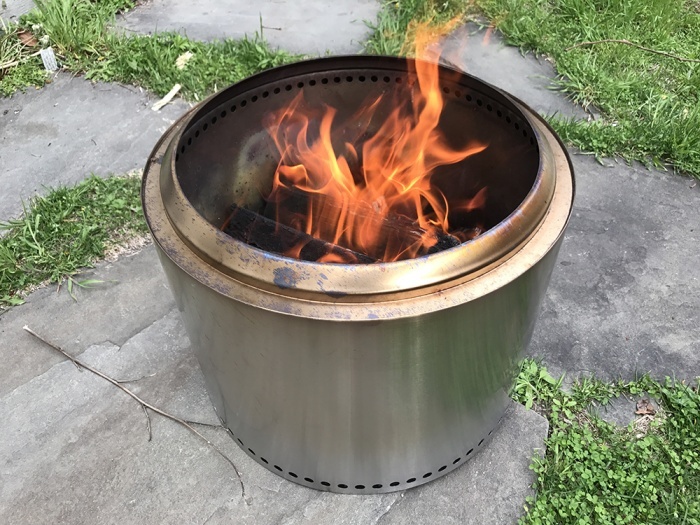 When the fire was transferred to a normal metal fire pit, it burned with a big smudge of dark smoke. The brand Solo Stove makes several other sizes. The Solo Stove Lite, Titan, and Campfire models are designed for cooking. They function on the same principles as the Bonfire but have built-on pot holders. 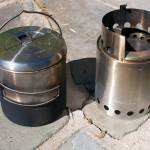 We’ve put these to the test and found the small Solo Stoves also effective. For those looking for camp-cooking devices that burn wood and tinder, the Solo Stove line is worth a look. 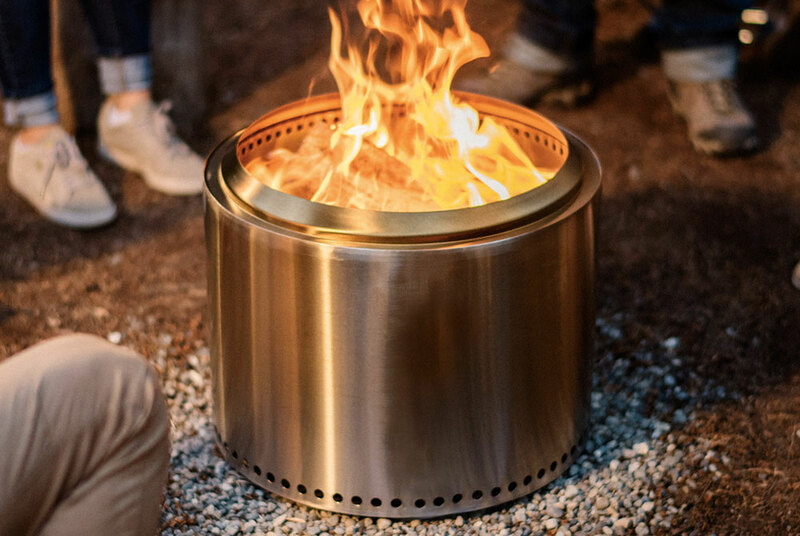 The Solo Stove Bonfire is made of 304 stainless steel. Given its size — 19.5″ wide x 14″ tall — it is reasonably light at 20 pounds. The unit comes in a storage sack and seems durable so long as it’s not abused. But the pit is not heavy-duty iron like those less expensive fire pits sold at Walmart or other outlets with camping gear. Don’t plan to huck logs into it a Solo Stove willy-nilly. You should be a little more gentle. Starting a fire is easy with good kindling; just build a tee-pee or cabin with small fuel and light it. We had a good blaze in minutes, and then we added some wrist-size branches. The fire soon roared. Once burning, the Solo Stove Bonfire burned hot and efficiently. The structure gets very hot, so don’t touch or move it until the fire is well out. The don’t-touch-it facet is was one thing we didn’t think about before testing — once this thing is lit, you’re committed for a while. That’s fine at a campsite or in a back yard. But some kind of handle or way to grasp the hot fire container would improve the product in case you need to douse the blaze early and move on. Overall, this is a highly-effective fire pit. For anyone in need of a backyard blaze without all the smoke, the Solo Stove Bonfire is an excellent choice.